Our Primary Election is next Tuesday. This is the opportunity for voters to select their potential governmental leaders, and determine which direction our governing bodies lean ideologically; more conservative or more liberal, or maintain the status quo. Voters who opt to not participate in the primary election, and then complain about the choices available in November, are at least partly to blame for those choices. If you want to have a say in the process, the primary is easily as important as the general election, especially when there are so many contested races as there are this year. I would never be so presumptive as to tell someone how to vote. Each voter is different, has different priorities, and has different expectations of their elected officials. I do, however, often share my rationale on electoral choices. And because I’ve been inundated with requests heading into Tuesday’s Primary Election, I thought I’d answer everyone at the same time with a terse rationale on each of the contested races on the Republican ballot that are non-judicial. I focus on the Republican ballot because I am a conservative. And in our two-party system, the GOP is closer ideologically to the fundamental principles our nation was founded on. So with that foreword, let’s look at the contested races on Bannock County’s primary ballot. U.S. Senator Jim Risch has been a superb senator, and a voice of reason and forbearance in a body comprised mostly of puppets to the administration. Definitely should be retained. The Second Congressional candidate Bryan Smith is coming from a comfortable position of never having governed, and having no voting record to defend, and makes me uncomfortable at times with his idyllic and simplistic stump speech lines. But that said, he’s not part of the Washington establishment that is perpetuating the status quo, which is “unsustainable,” according to the Congressional Budget Office. Smith seems less inclined to cave to the left, and his stance on removing the federal government from education (which should be administered at the local and state levels), and allowing the free market system to replace Washington’s crony-capitalism are spot on. The Governor’s race brings a newcomer to the state’s chief executive race, in Russ Fulcher, a highly regarded senator from Meridian. Fulcher is ardently opposed to Common Core, the federal government’s latest intrusion into the state’s domain of education and is perhaps idyllically devoted to state’s rights, undeterred by reality. I differ with him on a couple issues, but his idealism, consistently conservative voting record, and enthusiastic “can-do” attitude tip the scales for the primary in his favor. Brad Little has been a good Lieutenant Governor and should be retained. He opposes undue regulatory interference in the private sector, and firmly believes free enterprise, rather than government, creates economic opportunity. As a farmer and rancher, he understands government intrusion into the free enterprise system better than most. He’s the economic driver behind the current administration, and his opponent only has one issue he seems to be running on. Secretary of State candidate Evan Frasure is the only state executive office candidate from Eastern Idaho. Not only has he proven his immense competence on electoral issues, which the office is in charge of, but as a member of the State Land Board, he would oppose what the state has done of late to compete with commercial property in the private sector. Previous Speaker of the House, Lawrence Denney made too many questionable decisions as Speaker that makes me question his judgment. Brandon Woolf is the only candidate with the experience and credentials to serve as State Controller. He has been functioning in that capacity ever since Donna Jones retired after a serious car crash. Brandon has stepped up and managed the Controller’s office with “style and expertise,” according to an Eastern Idaho legislator, and he has taken the state’s “checkbook” online for complete transparency. That’s impressive! Chris Troupis I believe, would make a great Attorney General. He has the right perspective on federal lands, prevailing Idaho values, and seems bright and energetic. If the current AG were more willing to address natural resource issues, the decision would be more difficult. Superintendent of Public Instruction candidate John Eynon has been a teacher and is the only candidate opposed to federal intrusion into our educational system via Common Core. District 29 has no Senate candidate on the ballot. 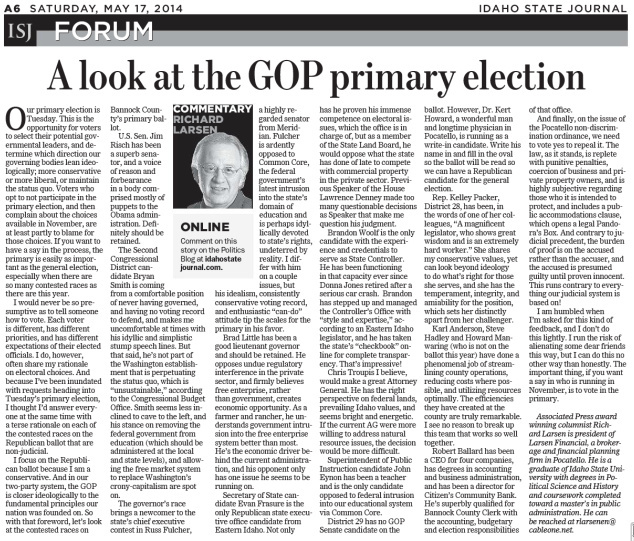 However, Dr. Kert Howard, a wonderful man, and longtime physician in Pocatello, is running as a write-in candidate. Write his name in and fill in the oval so the ballot will be read so we can have a candidate for the general election. Representative Kelley Packer, District 28, has been, in the words of one of her colleagues, “A magnificent legislator, who shows great wisdom and is an extremely hard worker.” She shares my conservative values, yet can look beyond ideology to do what’s right for those she serves, and she has the temperament, integrity, and amiability for the position, which sets her distinctly apart from her challenger. Karl Anderson, Steve Hadley, and Howard Manwaring (who is not on the ballot this year) have done a phenomenal job of streamlining county operations, reducing costs where possible, and utilizing resources optimally. The efficiencies they have created at the county are truly remarkable. I see no reason to break up this team that works so well together. Robert Ballard has been a CEO for four companies, has degrees in accounting and business administration, and has been a Director for Citizen’s Community Bank. He’s superbly qualified for Bannock County Clerk with the accounting, budgetary, and election responsibilities of that office. Dave Bowen may not have the extensive preparation for the job that Robert does, but he’s an honest, competent, capable man who would serve the county well. And finally, on the issue of the Pocatello Nondiscrimination ordinance, we need to vote yes to repeal it. The law, as it stands, is replete with punitive penalties, coercion of business and private property owners, and is highly subjective regarding those who it is intended to protect, and includes a public accommodations clause, which opens a legal Pandora’s Box. And contrary to judicial precedent, the burden of proof is on the accused rather than the accuser, and is presumed guilty until proven innocent. This runs contrary to everything our judicial system is based on! I am humbled when I’m asked for this kind of feedback, and I don’t do this lightly. I run the risk of alienating some dear friends this way, but I can do this no other way than honestly. The important thing, if you want a say in who is running in November, is to vote in the Primary.